After receiving his master’s degree in 1972 he continued his work as a researcher on the FDA study on the epidemiology of adverse drug reactions in hospitalized pediatric patients until he accepted a position as assistant professor of pharmacy in the College of Pharmacy in Sept. 1972. He assumed clinical pharmacy responsibilities in the pediatric department of Shands Hospital, coordinated the clinical pharmacy clerkship program, lectured on pediatric pharmacy in the therapeutics course, and coordinated an introductory pharmacology course for nursing students. He taught an elective course in pediatric pharmacy and supervised pharmacy students in a pediatric pharmacy clerkship for many years prior to assuming administrative positions in the College of Pharmacy. For 24 years he coordinated and taught a UF Honors Seminar: In Search of Magic Bullets for students in the Honors Program. He was recently recognized by the UF Honors Program as the Honors Professor of the Year for 2015-2016. He helped organize, implement and teach in a new course, Medications and Health, for UF undergraduates in the spring semester 2016. In 1977 he was promoted to associate professor and decided to take a two year leave of absence to complete requirements for the Doctor of Philosophy degree in clinical pharmacy at Purdue University. After receiving the Ph.D. degree he returned to the College of Pharmacy and assumed clinical pharmacy responsibilities in the pediatric ambulatory clinic and coordinated the therapeutics course. He accepted the position as coordinator of the post-baccalaureate Doctor of Pharmacy program in 1981. In 1984 he was appointed as assistant dean for student affairs responsible for recruitment, prepharmacy counseling, financial aid, awards, academic performance, registration, examination scheduling, classroom scheduling, and faculty advisement. In 1989 he was promoted to professor of pharmacy in the department of pharmacy practice and as associate dean for student affairs. Promoted to associate dean for academic and student affairs in 1995, he was given the responsibility over curriculum development and faculty development in addition to student affairs responsibilities. He worked with the college’s curriculum task force and the curriculum committee to assist in the planning, organization, implementation, and evaluation of a new Doctor of Pharmacy curriculum. 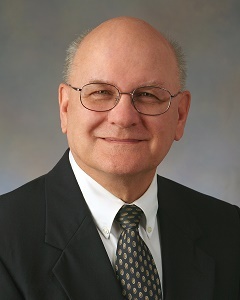 In 1999 he was promoted to associate dean for professional affairs with administrative responsibilities in student affairs, academic affairs, and the clinical experiential program. He also was given responsibilities as the College’s Equal Employment Opportunity Officer. In 2005 he was promoted to senior associate dean for professional affairs. As an administrator in the College of Pharmacy he and the staff in the Office for Student Affairs along with other offices in the College implemented and refined programs and events that have enhanced the services to students and faculty in the College. These include the peer advisor program, faculty advisor program, early academic warning program, orientations, awards ceremonies, open houses, career days, white coating ceremony, commencement ceremonies, computer database for applications and admissions, and recruitment activities. He has chaired the admissions committee, academic and professional standards committee, and financial aid and awards committee during his tenure in the Office for Student Affairs. He was instrumental in the creation of joint degree programs for pharmacy students to obtain the Doctor of Pharmacy and Master of Physician Assistant degrees, Doctor of Pharmacy and Master of Public Health degrees, Doctor of Pharmacy and Master of Business Administration degrees, and Doctor of Pharmacy and Doctor of Philosophy degrees. He coordinated and advised foreign pharmacists for many years in a special program to allow them to obtain the PharmD degree. He served on the task force to implement the Working Professional Pharm.D. Program for post-baccalaureate pharmacists. He was one of the first pharmacists in the country to develop a pediatric clinical clerkship site, a pediatric pharmacy course, publish data about the incidence and severity of adverse drug reactions in hospitalized pediatric patients, the prevalence of child abuse and neglect to draw pharmacists’ attention to this problem, and develop innovative, self-instructional, competency-based, multi-media modules on medication interviewing, patient counseling, and medication therapy monitoring. He was selected twice to be a co-recipient of the AACP Lyman Award for the best article in the American Journal of Pharmaceutical Education. He has published over 80 articles and chapters in the professional literature and made numerous presentations at continuing education and professional meetings. During his tenure in the College, he maintained membership in the American Pharmacists Association, American Association of Colleges of Pharmacy, Florida Pharmaceutical Association, and the Florida Society of Health System Pharmacists. He is also a member of Rho Chi Honorary Pharmaceutical Society and Phi Lambda Sigma National Leadership Society. He served as national President of Phi Lambda Sigma from 1990-1991 and served as the faculty advisor for the Iota Chapter of Phi Lambda Sigma for 28 years. He was selected as the national faculty advisor of the year for Phi Lambda Sigma in 2012. He has served as a member of the Florida Pharmacy Association House of Delegates for many years. In AACP he has served as chairman of the Student Personnel Special Interest Group, chairman of the PCAT Advisory Group, and as a member of the Nominations Committee, Lyman Award Committee, PharmCAS Advisory Panel, and the Constitution and By-Laws Committee. He served on the APhA/ASP-AACP Council of Deans Task Force on Professionalism and the AACP Advisory Group on background checks for pharmacy students.